The 6-1/2 digit DMMs plug into any 3U PXI or CompactPCI Chassis. The SMX2040 sports +3,300,000 counts, and has all the functionality and performance expected of a high quality bench-top DMM plus thermocouple measurements, offset ohms, and various triggering modes. The plug-in design provides the convenience of automated measurements, cost effectiveness, and the smallest possible footprint, with no compromise in performance. 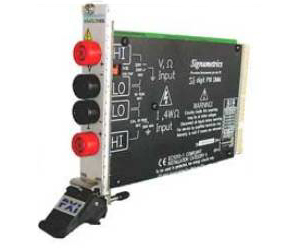 Signal leads go straight from the SMX2040 in your PXI chassis to the device under test or to an SMX4032 relay-switching card that switches among multiple inputs. It could not be more straightforward. Also the S/W is simplified since there is no intermediary IEEE488 controller with its associated command language.